We’d love your help. Let us know what’s wrong with this preview of Battle Angel Alita, Volume 06 by Yukito Kishiro. Alita's death sentence is commuted in exchange for her service as a member of the Tuned, an elite force of the utopian city of Tiphares. Her first assignment is to protect a nuclear-powered train from the infamous bandit known as Barjack. To ask other readers questions about Battle Angel Alita, Volume 06, please sign up. A new arc story, introducing a new main character. Alita sells her soul to Salem turning herself into the Dark Angel of Death and filling the emptiness left ito her heart with action and violence. The new storyline starting in this 6th volume is essentially a funny homage/parody of Bronson & Hara famous 80s manga/anime Fist of the North Star (北斗の拳 Hokuto no Ken), sadly Kenshiro Figure Four and the other new characters introduced here were just not much as interesting as the previous ones and author seems improvising a lot more than usual. Continued solid effort, though this was a little bit stranger as compared to the previous issues but that is understandable as even Alita's life changed in this issue so yeah this time around the most of the entire book is set out of scrap yard after all there's no one there for Alita. Now the action is set outside scrapyard and mostly in a desert and a city to boot in desert with skyscrapers was it maybe Dubai? Who knows fun fast and with a unkillable human protagonist who reminds me of Ryu or Continued solid effort, though this was a little bit stranger as compared to the previous issues but that is understandable as even Alita's life changed in this issue so yeah this time around the most of the entire book is set out of scrap yard after all there's no one there for Alita. Now the action is set outside scrapyard and mostly in a desert and a city to boot in desert with skyscrapers was it maybe Dubai? Who knows fun fast and with a unkillable human protagonist who reminds me of Ryu or someone from Street Fighter series of video games. So while the previous issue were high Fours, this is still four but a little on the lower side. Now on to the next one after all I plan on finishing all the issues before going to watch the movie. This is a good entry point if you don't want to start from the beginning. Most of the characters in it are new. Alita is executed for using a handgun to defeat Zapan in the previous volume, and only a stop order from Tiphares prevents it, after she is already so badly damaged that her teeth are nowhere near her face. She is then told she must agree with orders from Tiphares or her brain will die in less than two hours. She is trying to get back to Ido, now working as an assistant to Desty Nova a This is a good entry point if you don't want to start from the beginning. Most of the characters in it are new. 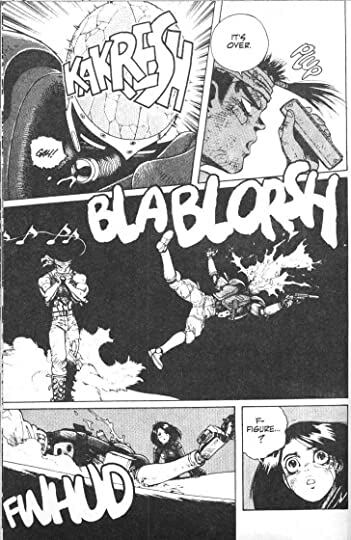 Alita is executed for using a handgun to defeat Zapan in the previous volume, and only a stop order from Tiphares prevents it, after she is already so badly damaged that her teeth are nowhere near her face. She is then told she must agree with orders from Tiphares or her brain will die in less than two hours. She is trying to get back to Ido, now working as an assistant to Desty Nova after the latter revived him as a cyborg, and Desty Nova is the one they want Alita to hunt down. 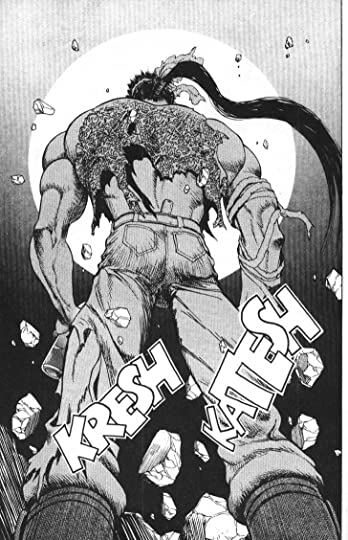 Tiphares is not prepared for Alita's attachment to the surface world, which Tiphares treats as worthless even though it is the source of all their necessities. I don't know why Alita looks black on the cover. Her skin is unshaded in the interior. Race is a complicated and bizarre issue in manga, and that cover makes it more so. Esdoc and Shumira appear to be black, and that's a bit insulting to black people. This book is very different from the others in that we go out to the country beyond the Scrapyard, on a train, in the desert, and finally to a city. The conflicts continue to be more complex than just the frequency and graphic nature of the fight scenes. You thought that scrapyard is no place to live? Wait until you see the rest of the world. One might ask, is this the same Alita that I've been reading for the past 5 volumes? It's relatively new, and weird and it gets going at the same time. I'm in this rush to read volume 7 in wanting to know what the hell is really going on now. A new Alita volume brings more action, more character development, a new ally (lover?). The ideas and story and artwork in this series have been excellent from the start and get better with each book. Another great entry. Love this material. Si bien esta serie me ha sorprendido por la versatilidad del maestro Kishiro y el cambio de géneros de la historia de volumen a volumen; este, el 6to volumen, no me sorprendió tanto. Tras los eventos del volumen anterior, la situación general de Gally cambia nuevamente. Con una nueva misión y un objetivo, Gally se pierde completamente para sumirse en la oscuridad y sed de sangre de la cual hemos visto algunos chispazos en los volúmenes anteriores. Si bien ya hemos visto peleas tipo shonen, peleas Si bien esta serie me ha sorprendido por la versatilidad del maestro Kishiro y el cambio de géneros de la historia de volumen a volumen; este, el 6to volumen, no me sorprendió tanto. Tras los eventos del volumen anterior, la situación general de Gally cambia nuevamente. Con una nueva misión y un objetivo, Gally se pierde completamente para sumirse en la oscuridad y sed de sangre de la cual hemos visto algunos chispazos en los volúmenes anteriores. Si bien ya hemos visto peleas tipo shonen, peleas tipo deportes, un poco de historia de amor, etc. Ahora tenemos un acercamiento al combate más táctico, con Gally mostrando más habilidades y artilugios que no habíamos presenciado antes. Se introducen nuevos personajes de soporte que me gustaron y nuevamente presenciamos algunos giros en la trama. Lo que más me decepcionó del volumen es que seguimos sin tener respuestas. Ambas interrogantes que más nos han preocupado (el pasado de Gally y la relación de Zalem con el mundo que plantean) siguen sin responderse. Aunque la situación de Gally cambia y aparenta a alinearse un poco a estas interrogantes, me gustaría que la historia se moviera un poco más rápido. El arte sigue siendo impresionante y los giros de la trama son bastante buenos, algunos personajes que ya conocíamos resurgen y aunque los percibíamos como buenos o malos, probablemente tras este volumen, nuestra opinión sobre ellos cambie un poco. Este volumen se siente más como transitorio entre lo anterior y el nuevo arco, y aunque eso es algo que no había visto en este manga, es un recurso muy utilizado por los mangakas de manera general. It's not like I was expecting Shakespeare, but this story is kinda disappointing me. As a work of the 90's, I can see why people loved it. The visuals are unlike what many had probably seen at the time and the violence is at an ultra level. But I was just expecting more narrative filling out of this episodic manga classic. Interesting changes in both Alita and what we learn from the setting. A tres tomos del final, con un nuevo arco y muchos nuevos personajes (¡Algunos sobreviven al tomo y todo! ), y con muy pocas respuestas con respecto a que es lo que realmente está pasando y el origen de Alita, se me ocurre que Yukito Kishiro había planeado que esta serie fuera bastante más larga. Después de la épica batalla con Zapan este volumen se siente como un par de pasos hacia atrás en cuanto a escala, pero la historia está buena y los personajes nuevos son divertidos, creando nuevas situaci A tres tomos del final, con un nuevo arco y muchos nuevos personajes (¡Algunos sobreviven al tomo y todo! ), y con muy pocas respuestas con respecto a que es lo que realmente está pasando y el origen de Alita, se me ocurre que Yukito Kishiro había planeado que esta serie fuera bastante más larga. Part of what makes Battle Angel Alita so fascinating is how often she ends up pivoting into new roles and story styles based on where things take her. And thus this is yet another shift as she agrees to become an agent of Zalem in the hopes of seeing Dr. Ido alive or otherwise avenged on Nova. This volume introduces a few minor characters but for the most part she's no longer tethered to supporting characters, which is a bit of a concern. Maybe things will get better. How will Alita fare as an agent of the Tune. Sigue muy en la línea de los anteriores. Alita goes to a dark place in her mind and profession but she makes a good friend along the way that helps her escape. Unrecommendable story, but great visuals. 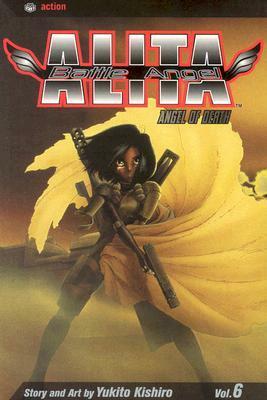 Having been sentenced to death for breaking Tipharan law by using Another of my favourite manga series that initially got me interested in Japanese manga and anime, Battle Angel Alita is another classic Japanese manga from the early 1990s.